Your ticket to Columbia just got put on hold, but only temporarily. 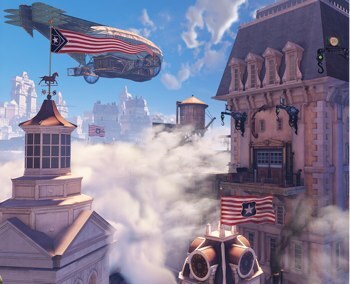 Before I and the rest of the journalists who had assembled for the BioShock Infinite preview event on Thursday were allowed to put our hands on the game, Ken Levine spoke briefly about the project as a whole. While it was largely upbeat news regarding Irrational's new title, he also revealed that the game would not meet its February 2013 launch date. The latest entry into the BioShock saga will launch instead on March 26, 2013. When speaking about the delay, Levine noted that while the game is progressing fantastically - and you can read my own impressions in a hands-on preview just published - Infinite could use one more round of "polishing and bug fixing" before it hits store shelves. While news of a delay is never easy to take, especially when it comes to a game as anticipated as Infinite, this one appears to be for the best. During my play time with the title, there were a few unfortunate bits of slowdown and some awkward loading pauses even during combat, so it's best to get these things ironed out before release.